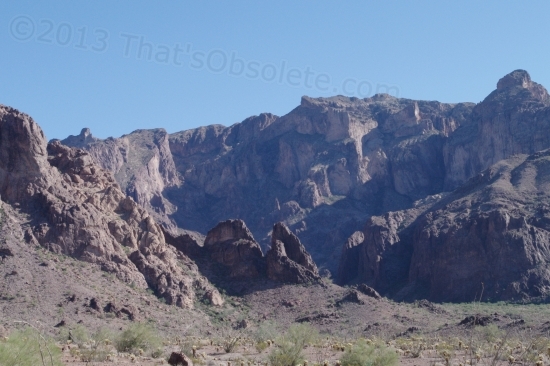 The Kofa Queen Canyon is about 19 miles south of Quartzsite, and about 8 miles east. Why did I pick it? 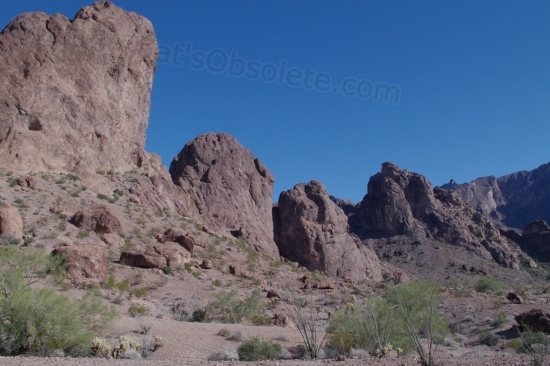 Read the Quartzsite Chamber of Commerce brochure: “4-wheel drive, rough road, unmaintained roads, only foot and horseback travel is permitted in areas bordering this trail.” I went. I saw. I conquered. But, not before wetting my pants. Several times. To say that it is rough and unmaintained is to say that comedian Jonathan Winters had a slightly unorthodox style. 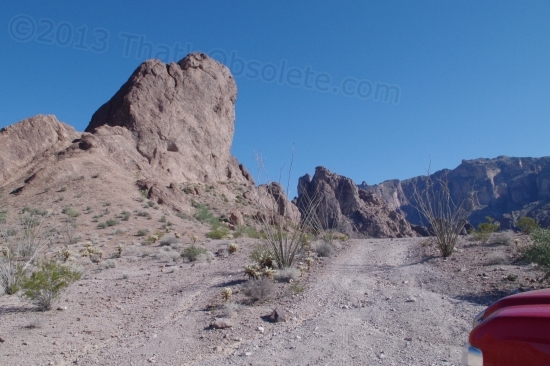 It’s a rock-strewn trail, not a road, that slowly and arduously leads upward nearly a thousand feet over four miles of alarmingly bad passage. It contains many small dry washes that are abrupt and nasty, much like that kid you sat next to in high school. I’ve never driven the Ford off-road. The photos don’t really show the wheel-dropping depth that made me wonder if I should have added the FX-4 skid plate option under the Ford. After all, this is a long-wheelbase pickup, not a Jeep Wrangler or Cherokee. 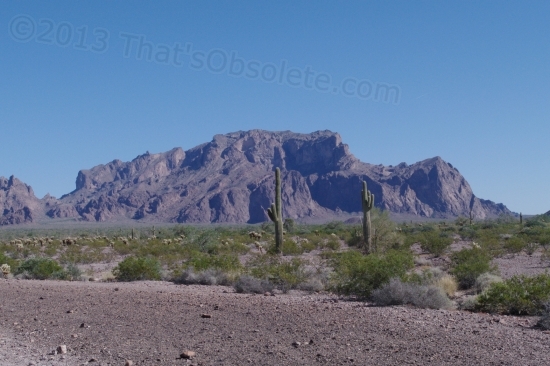 If you high-center it on anything, you might damage something important and be walking many miles in open desert. Considering that the Queen Canyon is part of a national wildlife refuge, the potential as sunset approaches, if you dwell on it, is interesting. My first clue was about 100 yards into this 4.4-mile ordeal. The trailer hitch dug deeply into the ground at the first dip, and I jumped out and removed it to stow it in the bed. From impulse, I hurried at first, and then realized, hey, there’s not another soul in sight. This is not a traffic-blocking situation. Relax. The lowest point of the trailer hitch is almost a foot and a half off the ground, so digging it in was new territory for me. 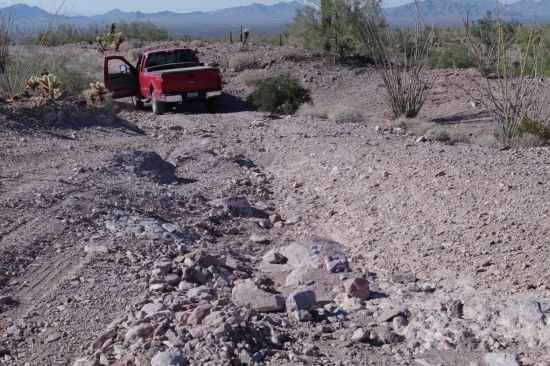 From then on, I was crawling into ditches and steering around tire-shredding sharp-edged rocks the entire way. Many of those rocks, considering the Ford’s total weight, looked like a real good way to break a tire cord, or peel rubber off during wheelspin. Wheelspin is what the torque-laden diesel excels at, and I could often hear the rear tires breaking loose and then digging in. The F-250’s stiff springs limited speed to an average of 5 MPH the whole way. A more softly-sprung SUV could have gone faster, but I was rocking from side to side like Elvis at an early concert. Four-wheel-drive? No. Not needed even going uphill – not with the bed loaded with a thousand pounds of water, tool boxes, equipment, and spare napkins. I never saw another person or vehicle going there or back, which was a semi-relief because there was usually nowhere to pull over and get out of the way without damaging something ecological. At my timid pace, going back was a confidence-builder because nothing had grounded out on the way up. It was only a matter of suspension twist and traction. All I could think of the whole time was that my friend Matt, if he comes up to visit per threat in late February, is gonna love driving this behemoth on this trail. Adventure! Just pack some water and some comfortable walking shoes. And pepper spray. 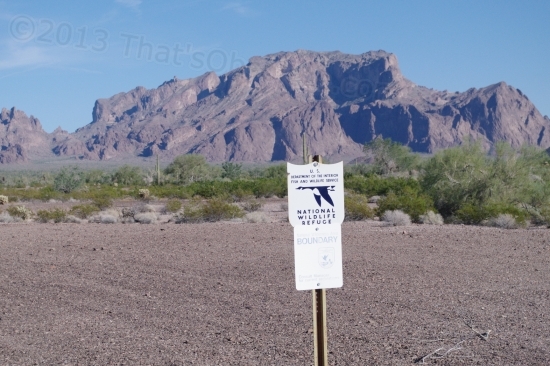 And perhaps a large-bore pistol. Overall, it was a kick. As usual, a camera doesn’t do the final destination justice. Tootling along at walking speed, the vista ahead was inspiring. Nope, doesn’t show it at all. There were many climbs which included a deep gully full of large rocks on one side that were hard to avoid. Halfway in was a sign reminding readers not to do anything ecologically naughty. Sure, the trail was its own reward, but the features of Queen Canyon itself were most impressive as well.